Isaak has a cold. Blah! Our weather can't make up it's mind, so I'm sure that is just lovely for sickness. Tomorrow it's supposed to be in the 50s and on Thursday we're supposed to have a major snow storm. I noticed his face is really dry to. I have a lotion that contains only certified organic ingredients. I've used it on his arms and legs many times. I decided to apply some to his face. BAM he got hives all over. I washed it off his face and gave him some allergy medicine. The rash was gone 30 minutes later. It stinks that Isaak has such sensitive skin. I'm like that to, but I don't think I was at his age. Awww, poor Isaak, I bet it was itchy. I used to be more sensitive than I am now. Maybe I am less so because I am eating more foods that aren't triggers for stuff like that. 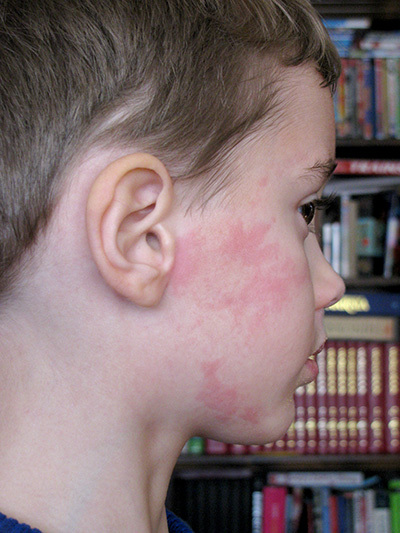 It has been so dry in our house that it's a wonder we all aren't broken out in a rash. I hope Isaak will be fully well soon. I am glad the medicine got rid of the rash quickly. Thank goodness it went away quickly. Your weather sounds just like ours in Michigan. Isaak is getting to look more and more like Mica in his pictures. Ough, glad that the rash was finally gone. My 2nd son has sensitive skin too. At first I wasn't aware. When we were staying in one of the middle east country during winter he got rash all over his body. I was so worried because it was so bad. But he didn't feel itchy. I applied various paste, lotions and still nothing happened. I thought it was because of bedbugs, got cleaned the mattress and the sheet and the blanket but also nothing happened. And he didn't act as if he was irritated with the condition. And then when summer comes all the rash gone. Awwww, poor Isaak!! Glad it went away quickly! I have super sensitive skin, so I get it. Luckily, my kids aren't as sensitive as I am. Poor little guy! Do certain fabrics irritate him too? awe, poor thing... was it painful? My son always had sensitive skin too. It is hard to figure out what to use on them. But definitely natural products if any at all. Awww, poor guy! That looks so uncomfortable! Glad it cleared up quickly! My kids have sensitive skin too, and breakouts stink! I used to get that when I was little. Very itchy!! Amazing how the face can be sensitive to product when the body isnt't. Some essential oils or flowers in products, organic or not, do that to me so maybe for him too? I used to not have sensitive skin but when I turned 40 something happened because as each year went by since then, I have learned I am more and more sensitive to products I never was before. Lavendar is just one. Did you know it's used in so many things?? Bandaids for one!